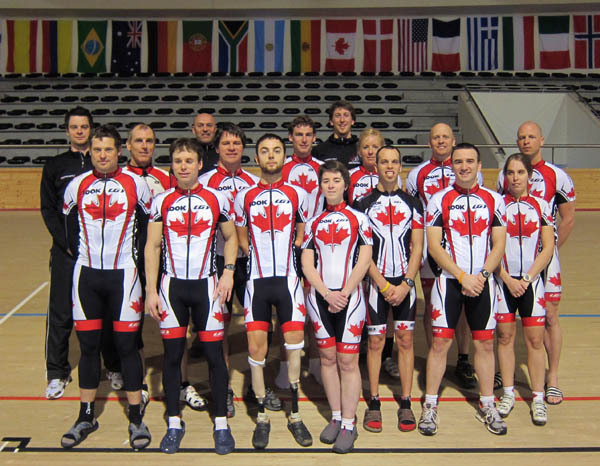 The Canadian Cycling Association (CCA) is sending 13 of its top para-cyclists to the 2011 UCI Para-Cycling Track World Championships, to be held in Montichiari, Italy, from March 11th to 14th. The Canadian contingent is headlined by defending Canadian Champions Marie-Claude Molnar (Sainte-Adèle, QC), Brayden McDougall (Calgary, AB), the tandem of William Stanley and Doug Baron (Calgary, AB) as well as the tandem of Daniel Chalifour (St-Jérome, QC) and Alexandre Cloutier (St-Antoine-de-Tilly, QC). The cyclists in the "cycle" (C1-C5) and "tandem" (B - Blind) categories will compete in both Sprint and Pursuit events, on the same track that hosted the 2010 UCI Junior Track World Championships last summer. Led by Head Coach Eric Van Den Eyde, the Canadian delegation travelled to Europe earlier in February and took part in a preparation camp in Portugal. The para-cycling track events will be presented at the 2012 London Paralympic Games.